The Anglican Church Grammar School (“Churchie”) sports activities assistant, came to us with a dilemma. “The Queensland Secondary School Association” Rugby football cup that dates back to 1918(wow!) has run out of room to engrave this year’s premiers, Churchie. Well we’re still going through white oak heaven (more on that soon!) 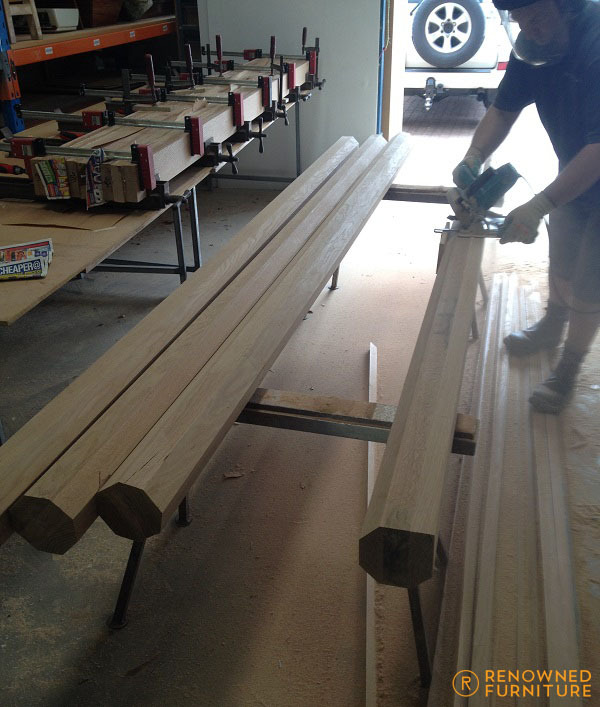 and now there are American oak poles rolling out of every spare bit of room we have left at the workshop. ( Time to start thinking about expanding 😉 ). 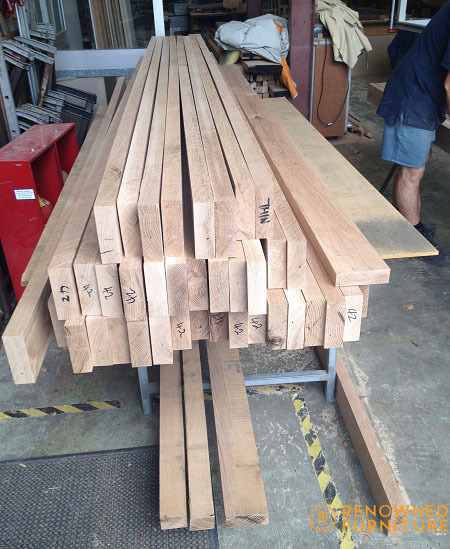 There had to be more than 4 cubic meters of raw American oak delivered for us to build the 50 (50- imagine that!) 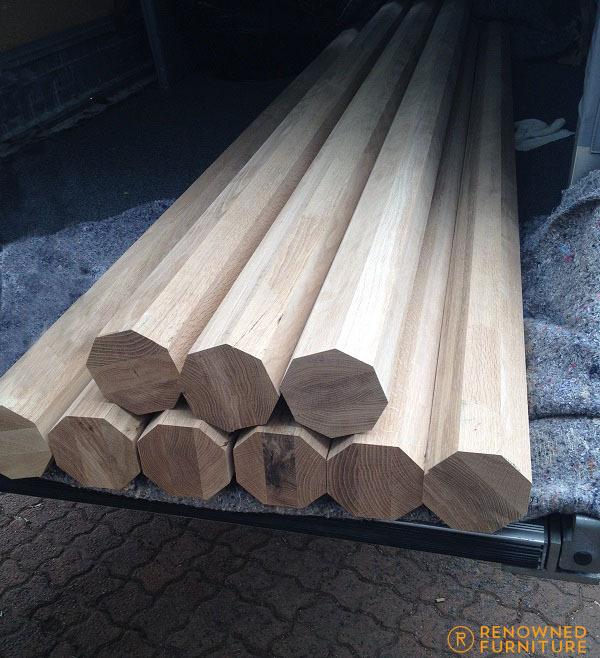 large round oak poles required for a new Japanese restaurant here in Brisbane. Hence this blurb’s title (Douzo Meshiagare) which is Japanese for “Enjoy your meal”. Each pole will finish up at 3.1 meters high and 100 mm in diameter so we’re looking forward to seeing the completed job. 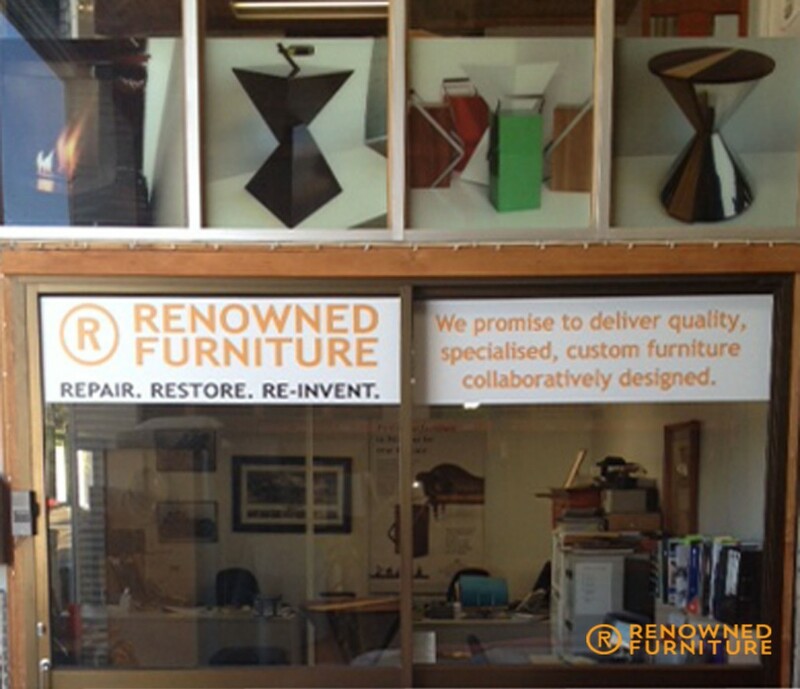 Renowned Furniture recently underwent a rebrand and added a fresh approach to their marketing. These initiatives are paying big dividends. We are suffering from growing pains and identifying areas where we have had to implement new systems and process to keep track of delivery promises, client requests, build slots, work in progress and so on. 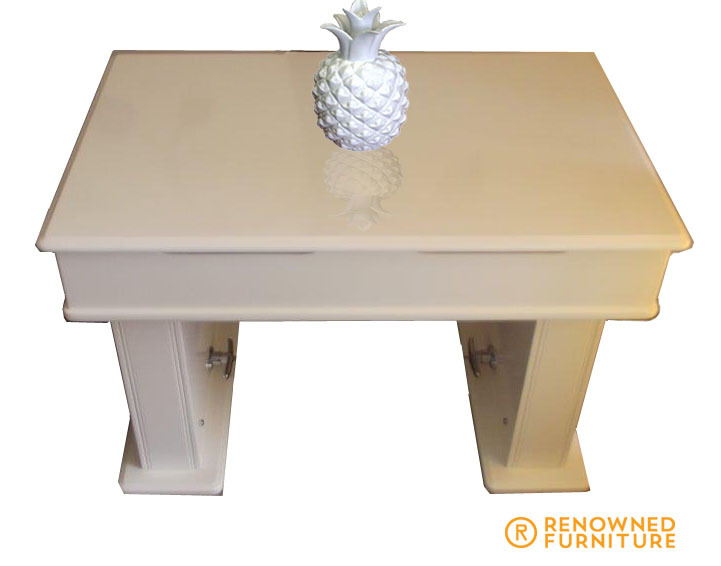 At a time when our industry suppliers such as high end timber suppliers, polish and paint suppliers and so on, are telling us “It’s still fairly quiet out there”, Renowned Furniture is at full pace with work load and it’s looking like it’s going to continue to grow out past the end of this year. 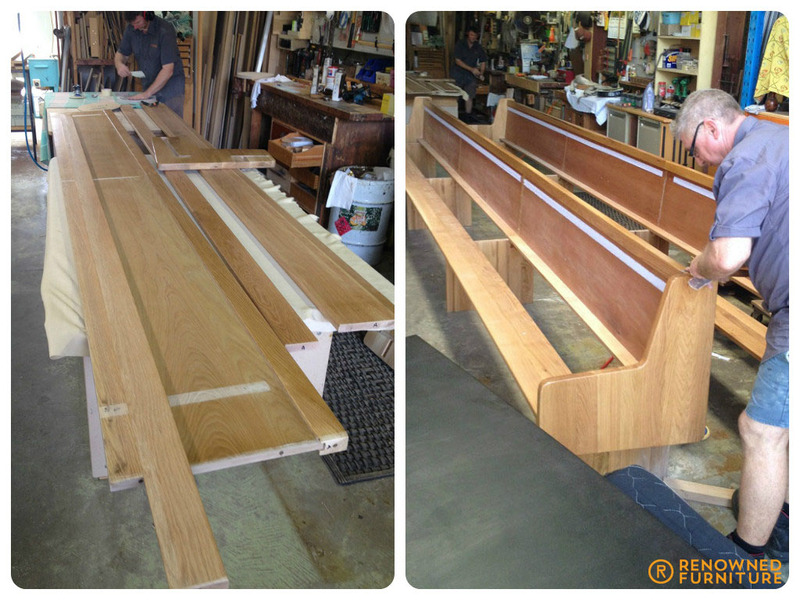 and the church furniture is starting to grow and fill all the available space we have. We have also recently acquired additional space in an adjoining industrial shed. 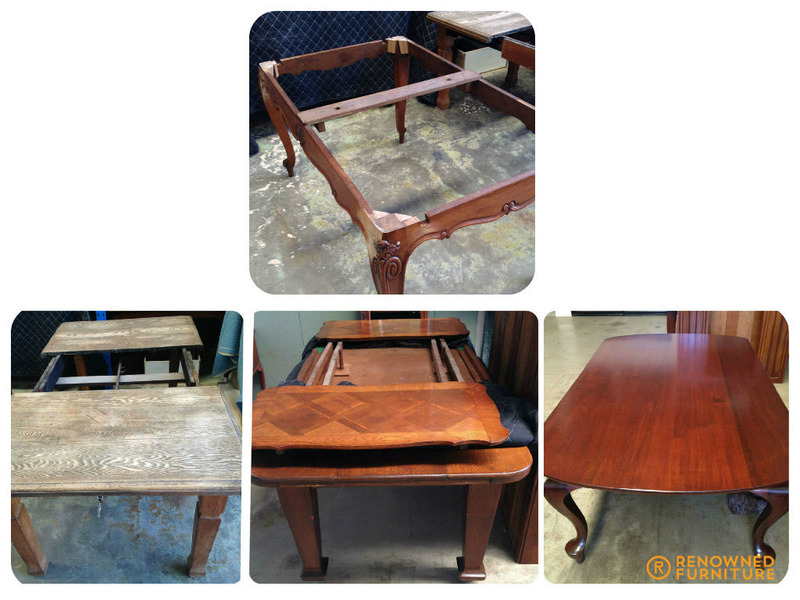 Here’s just some of what’s going on here at Renowned at this point in time. so that we can keep up the pace and not waste valuable craftsman time on deliveries. These are all the good problems that many of our counterparts are only dreaming of. Also, one of our team members, Alna has spent the last few months working our brand and keeping the Renowned detail high on the internet search engines profiles and the strategy is starting to pay big dividends. 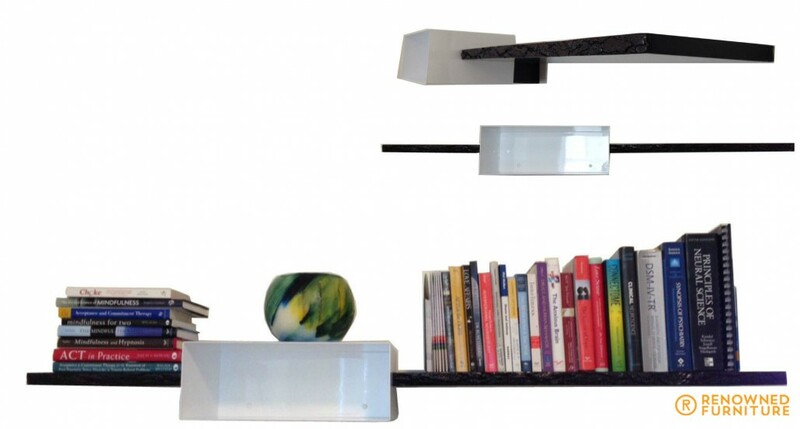 Natalie was over the moon with her purchase of the ‘woodpecker’ range of shelving that she found on our website showroom. 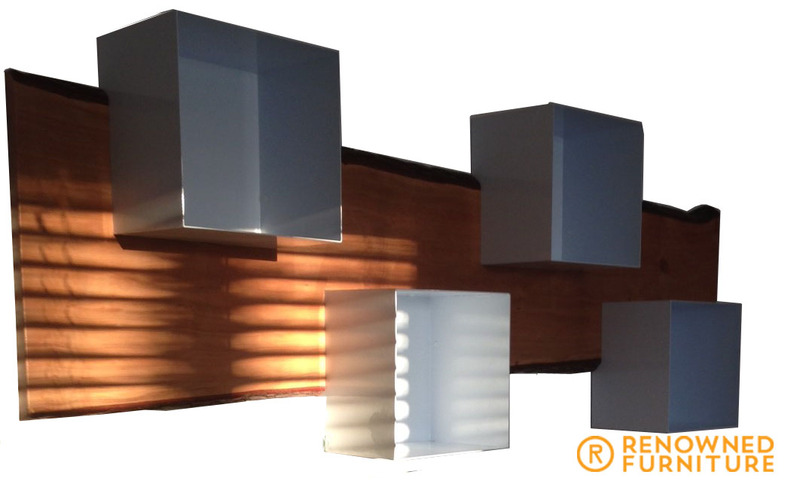 Natalie runs a psychology practice in Brisbane and was very particular about the type of décor. 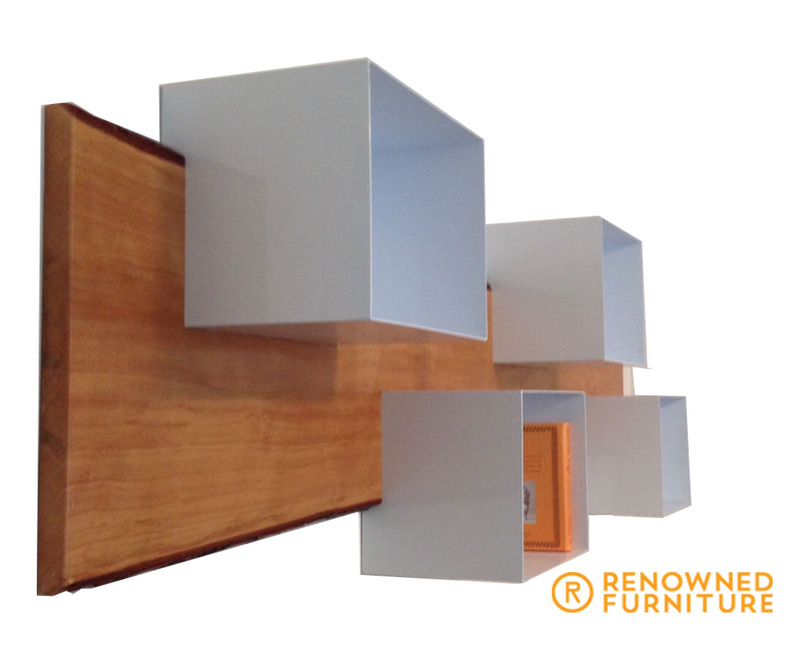 She worked with one of our craftsmen and had the range of shelves altered to suit her requirements. At the time, we were a little concerned that the alterations may be out of scale but we feel that Natalie’s vision was spot on. The timber for the shelves was locally grown Maple (right here in a neighbouring suburb called Salisbury) back in the 1980’s. 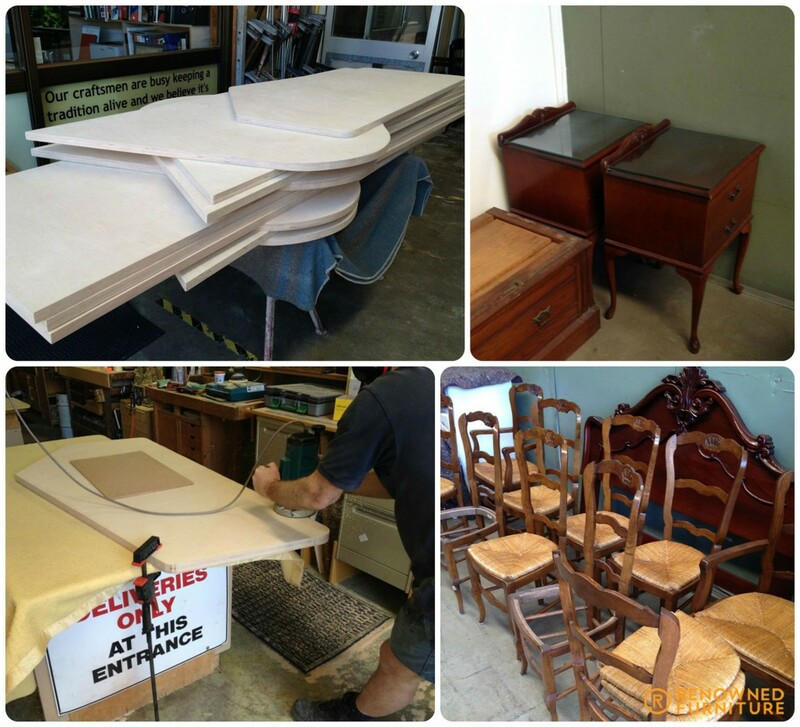 They were felled to make way for a housing estate and Renowned Furniture, a local furniture making identity were approached to see if they were interested in saving any of the timber, so here we are now turning it into fine furniture 35 years later . Now the range takes pride of place in Natalie’s new rooms and is both stunning with a look of strength and form but also very useful and practical. Natalie was also happy for us to link the story to her FB page Bulimba Psychology and said that she intended mentioning us on her page as well. So further to our story on the church full of furniture that was ordered a month ago, we are now well and truly on the way. 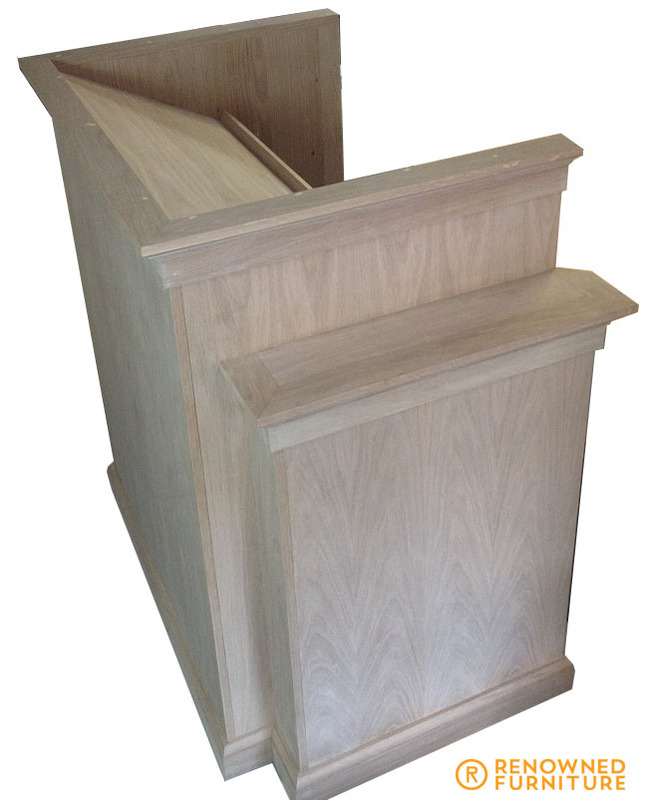 the white oak altar table and the pulpit. 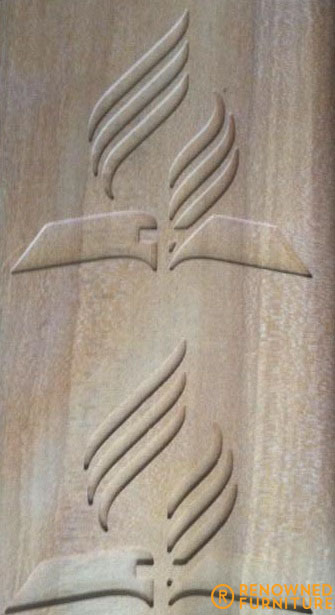 There is the Seventh Day Adventist logo carved into each piece as well. The next phase is to complete assembly and start sealing & polishing. coat for long lasting durability. 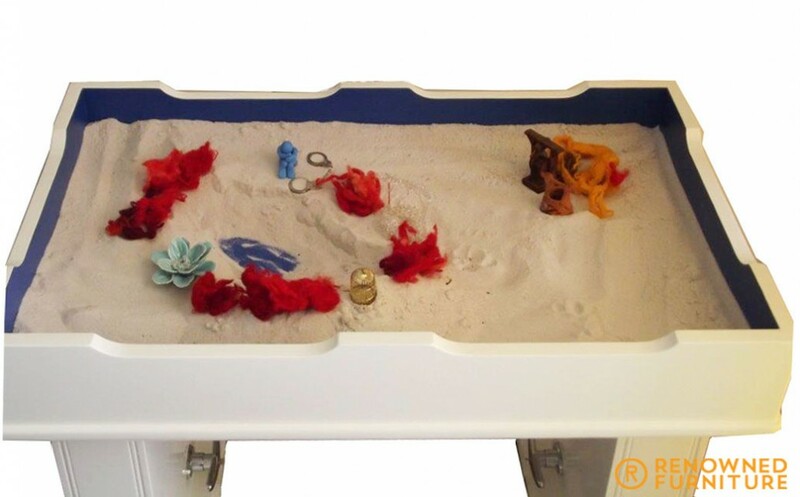 with handicapped children and there is a world renowned therapy using sand play that helps with all sorts of early development. 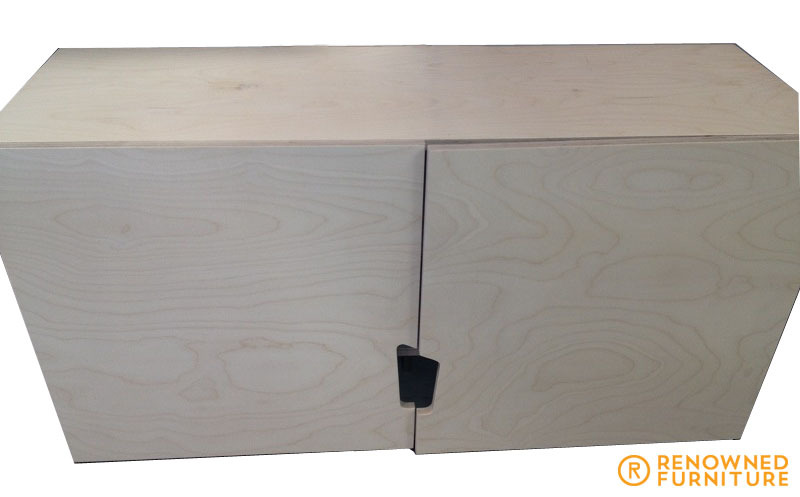 or small meeting tables as well. 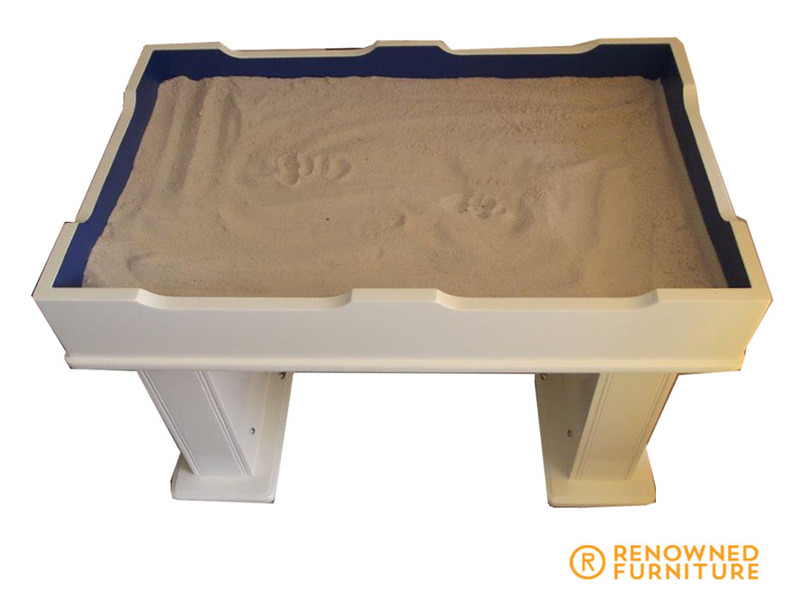 Once the sand is in there, they become quite heavy so of course, the tables need to be well made, safe and sturdy. Renowned portfolio. The client was over the moon with them. The Seventh Day Adventist church is nearing completion for us. We have had a very interesting ride with this job. 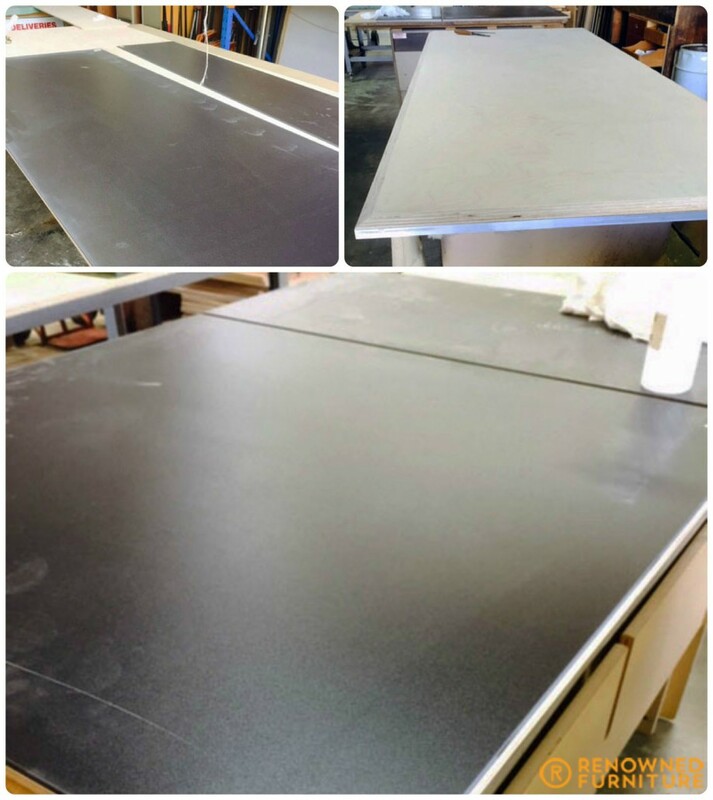 Keeping the mix of local and offshore manufacture, maintaining quality (bringing the offshore pieces up to our standard after their arrival prior to delivery) and ensuring client satisfaction remains at 100%. Before we sign off on the project (worth more than $240,000.00), we will conduct final quality checks and then put our name to it. 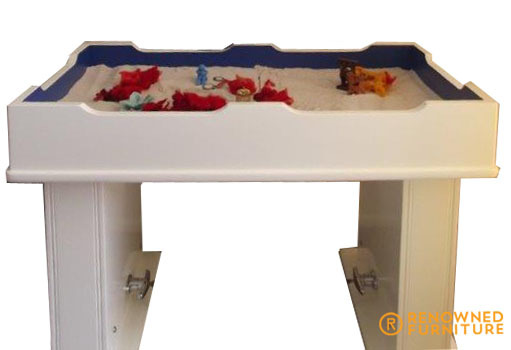 Renowned is a specialised company so managing projects of this size is a bit of a step up for us. Our managing director was previously in the mining industry (running a company he founded that was turning over several millions of dollars per annum) where managing projects 10 times this size was commonplace so the business side was well covered. 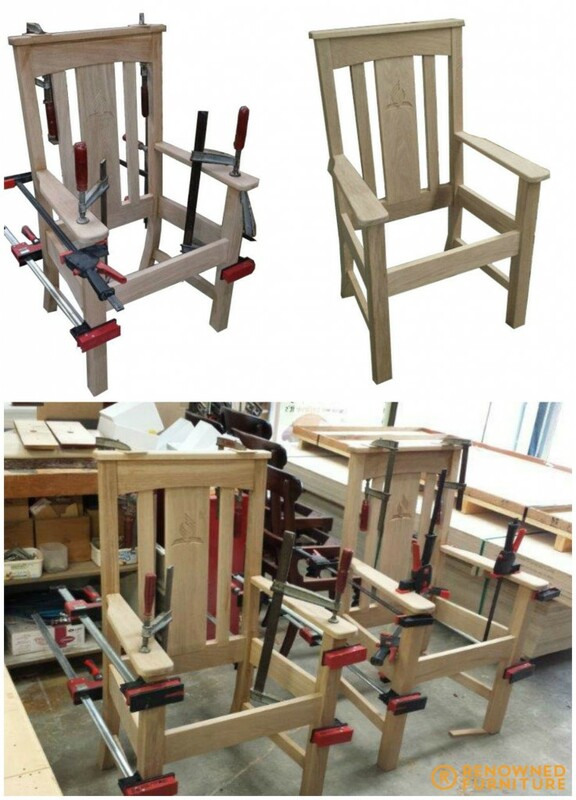 Our craftsmen have seen another side to their own industry first hand and while the early stages of this project saw a little in trepidation from their perspective, we feel that it has been an extremely positive learning experience where we now have master craftsmen thinking globally. 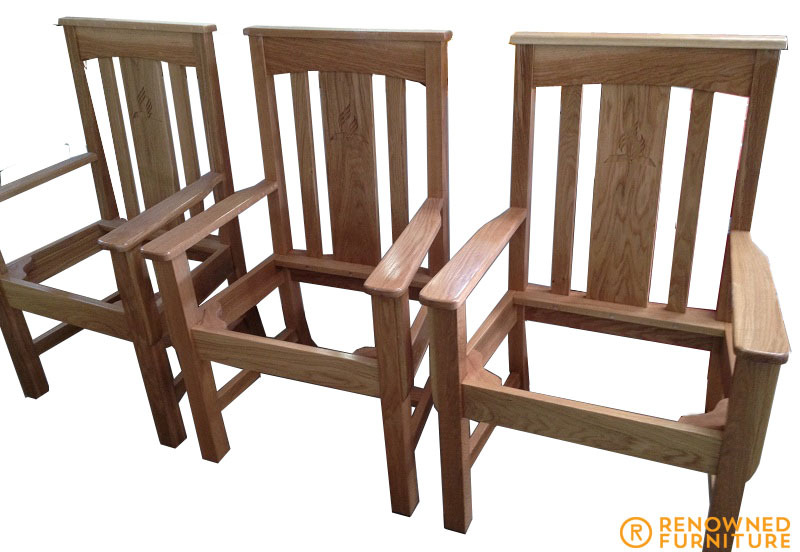 The 6 priest’s chairs have been completed with 3 in final sanding and 3 in final polishing. Here’s the altar table completed. The SDA logo has been carved into the top of the table, then filled with a 2 pack clear resin (it’s about 3 to 5 mm deep) to give it that 3 dimensional look and then 2 pack clear isolac topcoat for long lasting durability. 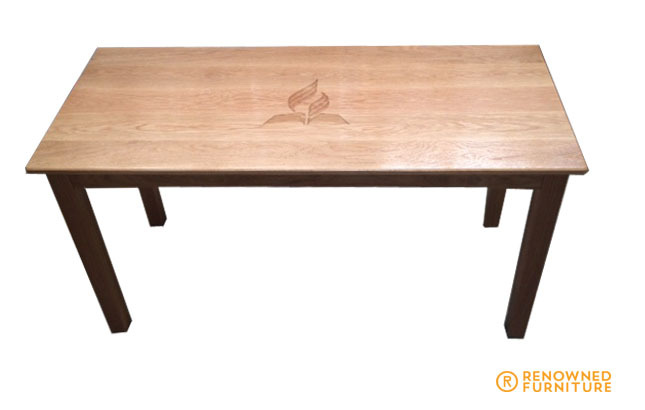 The solid oak table is designed to match the pulpit and the altar chairs. Again, there is the Seventh Day Adventist logo carved into each piece as well. 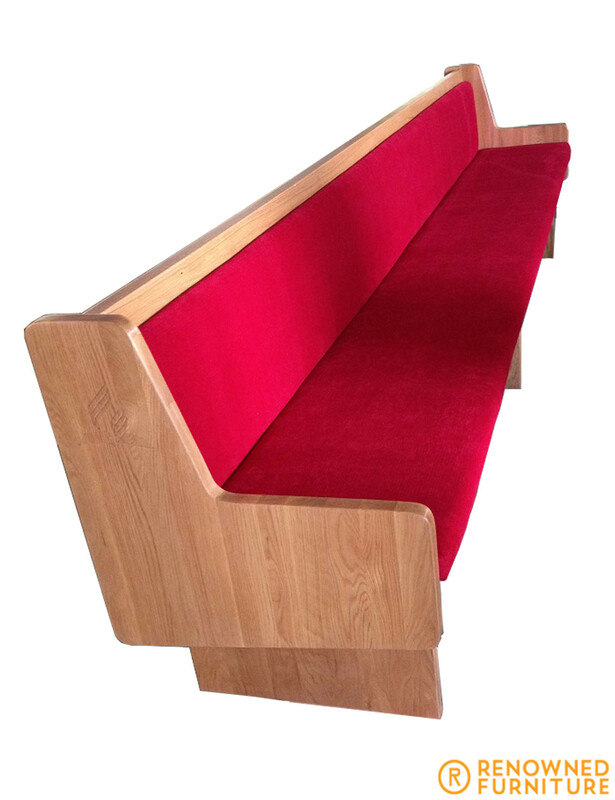 It was announced today that Renowned Furniture won the bid to design and build all of the furniture for a southeast Queensland church. The director, Dan Valmadre, said that the team were over the moon and had worked very hard to provide the right solution for the church within budget and in an acceptable timeframe to coincide with the churches plans. 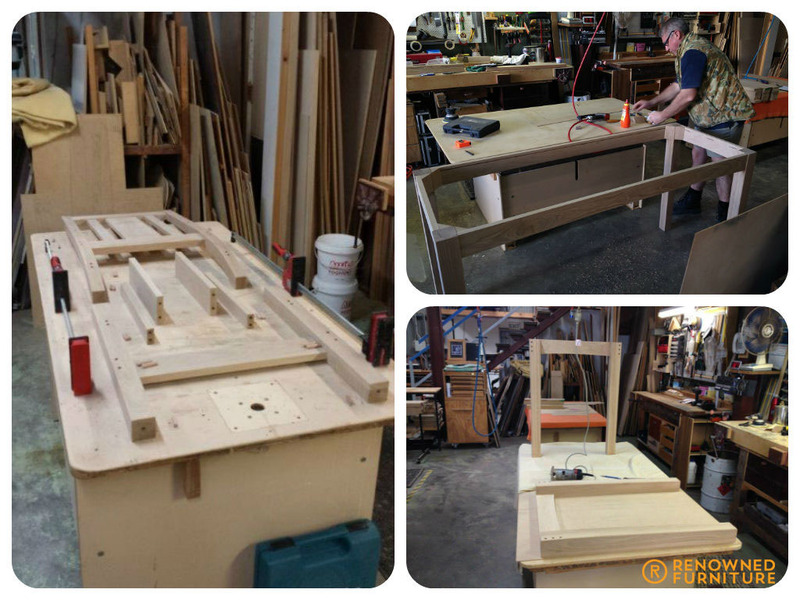 All of the furniture will be made using White Oak or depending on who you speak to, American oak. “We like to think we’re in “white oak heaven” at present “, Valmadre said. “As it has given the company some real street credibility on a number of fronts. Most importantly, the proof that quarter million dollar projects are well within our scope of capabilities. “, he added. 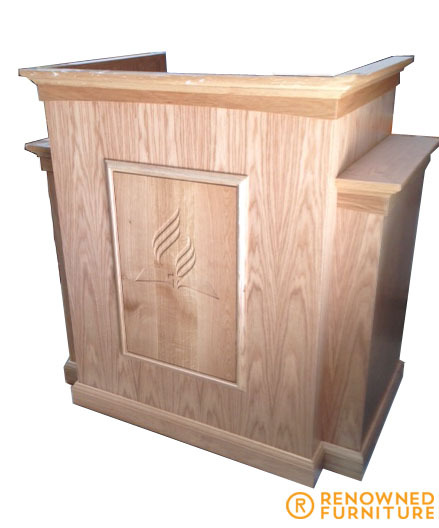 Renowned have also provided additional features such as the Adventist logo (comprising of an open bible with a cross and the 2 flames or angles arising pictured below) to be carved into all the furniture for that special touch. We’ll keep updates on the construction coming if anyone’s interested.